See what I mean? Kind of meh, but maybe that’s just me, and I digress. Obviously this isn’t the impressively bleak 15% Knowing received last spring, which is sad because I probably won’t enjoy The Sorcerer’s Apprentice nearly as much Knowing, but equally obvious is the fact that I will inevitably see this at some point anyways. After all, that’s why the intewebs gave us Cageflix. And once again, art students are crying into their organic tofu leftovers while listening to the saddest Cure B-sides they know. This entry was posted on Wednesday, July 14th, 2010 at 6:43 pm and is filed under Art and Movies. Tagged: Alfred Molina, Brandon Bird, Celebrity Culture, Disney, Jay Baruchel, Jerry Bruckheimer, Jon Turteltaub, Knowing, Nicolas Cage, Oil Painting, The Sorcerer's Apprentice, Uncanny Valley. You can feed this entry. You can leave a response, or trackback from your own site. 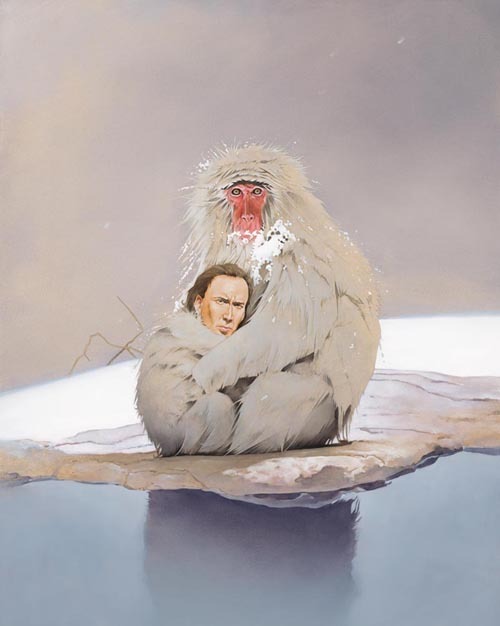 The elder snow monkey should have had the face of Christoper Walken.